Maybe this is just my millennial self talking here, but it sure seems like back in the day, parenting decisions were made in private. Where your kids would sleep at night, how you'd discipline them, and what you'd feeding them might be gossiped about behind your back. But now, as we expose an increasing number of details about our personal lives on social media, those decisions quickly become fodder for opinionated strangers in an open forum. Especially if you're a celeb parent. Case in point: Earlier this week, a photo of Macklemore co-sleeping with his baby daughter, Sloane, unleashed haters from the far corners of the Internet — but it's just the latest story of celebrity dad-shaming we've seen this year. Upon first glance, the picture and its caption, oozes pure sweetness: "There is nothing better," it reads. (I mean, really, what is cuter than a dad napping with his angelic baby?) But it wasn't long before the photo of Macklemore and his daughter bed-sharing turned into a big wave of negative comments from parents who warned of the serious risks the practice poses. "This it's actually quite dangerous," Filipe O. said of the picture on Facebook, where Macklemore reposted it. "A lot of children die sleeping with their parents. Children should sleep always in their own bed or with u if you are awake." Anthony S. also weighed in on Facebook, saying, "This is so wrong on so many levels. A person cannot sleep with a baby in same bed as them cuz person could always roll over on the baby [sic]." 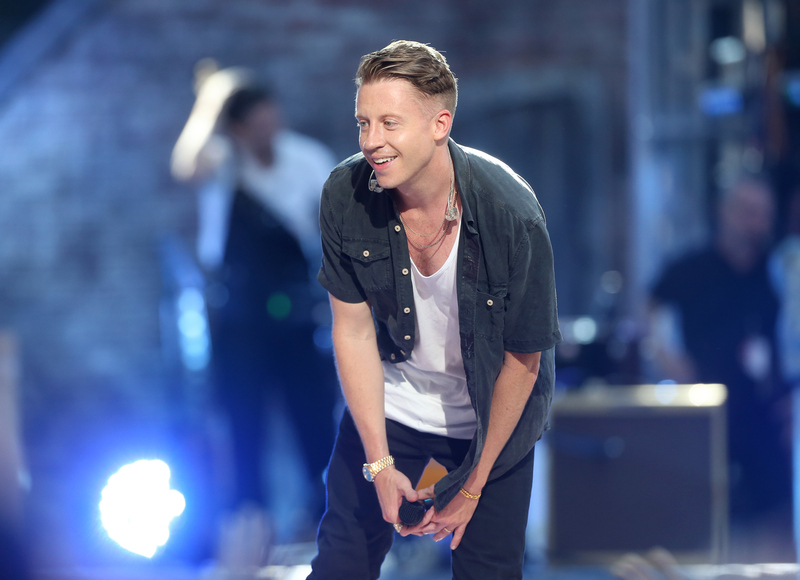 Although the fury at Macklemore definitely felt over-the-top, the commenters did have a point about one thing: The American Academy of Pediatrics warns against sharing a bed, which has been linked to Sudden Infant Death Syndrome (SIDS). Instead, they say the best place for a baby is in a crib within reach and without extra blankets and pillows. Earlier this year, Ryan Reynolds also came under fire for — of all things — a Father's Day tribute from wife Blake Lively. In the picture, Ryan was holding his baby daughter in a baby carrier. As people online were quick to point out, baby-wearing experts suggest keeping the little one's face close enough to kiss and legs spread in a natural, frog-like position. Speaking to Matt Lauer on Today about the baby-wearing controversy a few weeks later, Ryan admitted he (now knows) "the baby's not properly secured in the vessel that I'm wearing there." However, he wasn't losing any sleep over the fuss. As he perfectly put it, "I'm a first-time dad, and that is not the first mistake I've made. I can guarantee you it won't be last." In general, researchers say dads seem to do a better job than moms at cutting each other some slack. In a Yahoo Parenting survey about fathers' roles and identities, three in four male respondents said they try not to judge others. In contrast, more than 90 percent of moms admitted they have been critical of fellow mothers. I know most people have good intentions when expressing fears another kid could be in danger. In those cases, let's at least try to be tactful about suggesting a better method to Mom or Dad. And, when no one's life is at risk, let's take a cue from the guys by easing up on each other. Parenting isn't a one-size-fits-all scenario, after all.